The Mising are an indigenous tribal community inhabiting 11 districts of Assam and Arunachal Pradesh. They were earlier called Miris in historical days and the Constitution of India still refers to them as Miris. Miri is the older name and traces back to the ancestor Abotani. Misings are recognised as a Scheduled Tribe by the Indian government under the name 'Miri'. Mising derives from two words 'Mi' and 'Yasing'. 'Mi' means 'men, while 'yasing' means fair or worthy, so 'Mising' means a 'worthy man'. To depict other indigenous Assamese communities the word 'Mipak' is used extensively. The Misings belong to the greater group of Tani people, who speak languages of the Sino-Tibetan family, which comprise many tribes of Arunachal Pradesh in India and Tibet. All Tani tribes share linguistic, cultural and ritual similarities. There is no written history of Misings about their migration from Northern China to the plains of Assam but history was passed down orally in the form of folk songs and stories by the ancestors from generation to generation and is still prevalent among their society. Though they belong to Tani group of tribes and they used to be hill dwellers, they started living on the banks of rivers in the plains of Assam. The reason for this change of habitat is not known, but there are theories. One theory says that the Misings presently living in plains of Assam were not one single tribe, but it evolved into one when many tribes from various Tani tribes of Arunachal Pradesh migrated to the plains of Assam. This explains the presence of many Mising clans with different Mising dialects as well as different levels of development. The Mising currently enjoys constitutional autonomy under the Mising Autonomous Council, which was formed after the Mising Autonomous Council Act of 1995 passed by the Assam Legislative Assembly and assented to by the Governor of Assam following violent clashes in early 90s for greater autonomy. MAC includes 40 constituencies in eight upper Assam districts comprising core areas and satellite areas. Executive councillor (EC) from 36 constituency are elected democratically while 4 other members are represented by the ruling government of Assam. Tensions exist between the Mising tribe and other communities regarding the inclusion of few Non-Mising villages in MAC although no violence occurred between Misings and Mipaks but some other Assamese unions clashed with the police. MAC areas constitute of more than 60% Mising population and other communities are a minority. In Assam's Dhemaji and North Lakhimpur District, bordering Arunachal Pradesh, the population of the Misings is largest followed by Majuli District. Since 1983 Mising organizations have been demanding Sixth Schedule status under the Constitution of India in Mising dominated areas. Various Mising nationalist organizations have been formed during the modern era of civilization like Takam Mising Porin Kébang (Mising Students' Union) and Mising Ba:né Kébang (Mising Council). In 2009 an armed Mising organization under the banner of Liberal Democratic Council of Misingland (LDCM) was formed for a separate homeland for Misings in Upper Assam. They seek secession from Assam state and reason cited are years of discrimination against the marginalized indigenous ST/SC communities by the Assam government and few so-called high caste elite Assamese. Many young people have joined the organization and received training in Myanmar and Arunachal Pradesh. The base camp is probably located somewhere on the Indo-Myanmar border. They are active in all the Mising dominated districts of Upper Assam. Political and social awareness among Misings, and fear of outside non-indigenous encroachment on their language and culture have caused many young Misings to carry on the struggle. According to Census of India conducted in 2011, the population of Mising in Assam is 6,87,310; of which 3,95,790 are male and 2,67,520 female. They live in 10 districts of Assam: Dhemaji, Lakhimpur, Sonitpur, Tinsukia, Dibrugarh, Sivasagar, Majuli, Charaideo, Jorhat and Golaghat, and in three districts of Arunachal Pradesh: East Siang district, Lower Dibang Valley, and Lohit. The most prominent Mising villages in Arunachal Pradesh are Oyan, Namsing, Leku, Jelam of East Siang district. In Lohit District's Namsai the Misings are in large numbers specially in Silatoo Mising village. . The usage of the term Moyengia, Oyengia, and Sayengia etc., carry no meaning in determining an "Opín" (Clan) because families of different Opín are found in the said group. In the same way, the division into Barogam and Do:gam, which was an administrative system introduced during Chutia Kingdom, is non-existent in the society today. As such the multifarious form of division, have no bearing at all in the identification of Gu:mín ad Opín Concept since time immemorial in maintaining their fabric of the socio-cultural system. The rest of the Mising community still uses the Mising language to communicate with each other while using the Assamese language to communicate with other indigenous Assamese communities. The Opín of Gu:mín are all blood-related brothers known as "urom bibosunam bírrang" originating from a common ancestor father and there is no restriction in offering prayers in the rituals in common platform generations together. There is another form of brotherhood existing in the society which has been traditionally accepted as an affiliated brother or "tomín sunam Bírrang" from different opín. In both types of Brotherhood marriage among themselves is forbidden in the society. The community has various Clans as, including: Doley,Pegu,Bori, Gam,Charoh, Dao, Darig, Dang, Jimey, Kuli, Kutum, Kumbang, Kaman, Kardong, Kari, Lagachu, Loying, Modi, Moyong, Morang, Mili, Medok, Misong, Narah, Ngate, Pangging,Pasar,Pérme, Pértin, Pait, Pagag, Patir, Patiri, Padi, Payeng, Payun, Pao, Pádun, Regon, Rátan, chungkrang, Chintey, Charoh, Taw, Taye, Taid, Tayeng, Tayung and Yein. A:bang It is a verse of hymn of praise and worship of gods and goddesses. A:bang is sung by the Mibu (priest) at rituals. There is also community A:bangs generally used in Pobua, a ritual festival, praying for better crops, health and happiness. Kaban It is one of the oldest forms of Mising folk songs. It is lamentation music and recalls sad events. At the death of a dear one, the women burst out into a sort of cry and song which for an outsider may sound funny. Tébo Tékang It is a romantic lyric, narrating some love encounters. Sí:lung Ni:tom It is a melancholic song, sung in lonely places like jungle. Bini: These are lullabies sung either at home or in the field, taking babies to places of work. The baby is tied to the back of the mother or the young babysitter. Midang Ni:tom This is usually sung at the time of ushering in a bride to her new home, often in order to tease her. These too are rather melancholic, since they depict the sadness of brides wailing at being separated from her family, friends and the familiar childhood environment. Oi Ni:tom It is the most popular form of Mising folk song, sung by Mising youths when they are working or moving about the fields, woods, etc. It is an integral part of the Mising So:man (dance). It has a variety of themes ranging from romance, humour, tragedy, and socio-cultural motifs. Each line in an Oi-Nitom is of seven syllables. Misings have rich folk music. Apart from dumdum, lu:pi, lé:nong, marbang, bali, etc. used in Gumrag dance and which are common to other locals, the following are the typical type of traditional instruments played in Mising folk music: éjuk tapung, dérki: tapung, tumbo tapung, tu:tok tapung, ketpong tapung, gekre tapung, dendun, dumpak ko:rég, gunggang, tulung etc. These are mostly wind instruments made of bamboo. Yoksa (sword) is used as a musical instrument by the priest (Mibu) during the religious dance. There are many types of Mising dances, and each has their particular rules. Gumrag is performed five times in circles. Drums and cymbols are the usual musical instruments for the dances. It is a priestly dance performed mostly during Po:rag, the harvesting festival, observed in the Murong, the community hall of the Misings. The priest sings the A:bang while performing this ritual dance. This is a kind of merry-making song and dance often performed for fun, by young boys and girls with the accompaniment of drums or cymbals. It marks the beginning of the influx of the Mising people from hills to plains of Assam. Occasionally, all sections of Mising people indulge in singing and dancing lereli in sheer fun and merriment, especially at meeting old friends. This is a very ancient form of dance performed to the accompaniment of ejug tapung, a wind instrument resembling the snake charmer’s been. This dance is performed on the occasion of Ali-A:yé-Lígang and in Mising Bihu. The Misings are a patrilineal and patriarchal society and so, as per customary law, only the male children are entitled to inherit the property of a family. However, daughters can inherit the clothes and jewelry of their mothers. Marriages amongst the Misings take place in four ways: (i) formal marriages through negotiation, (ii) marriage by elopement, (iii) marriage through a very simple ceremony, and (iv) marriage by force (this was not a practice of the mising tribe but was the mentality of the parents like other people too). The last one, in which a man makes a woman his wife against her will by whisking her away from someplace and starting to live together, is no longer in practice. Extreme poverty or inconvenience force families to arrange a marriage of the third kind, in which a few elders, invited to the house of the groom, bless the would-be couple over a few bowls of rice beer – and the wedding is over. The most common form of marriage in rural areas even today is the one by elopement. When a boy is in love with a girl and intends to marry her, but cannot afford the cost of a formal marriage, or expects some opposition to the marriage from some quarter, or would like to start a conjugal life without delay, he chooses elopement with the girl as the best option. More often than not, marriages by elopement are followed by due social recognition through simple formalities. Formal marriages are arranged through two or three stages of negotiation, but although arranged by parents or guardians, the marriage of a boy and a girl totally unknown to each other, would be very rare. Formal marriages amongst them appear to have been influenced to a great extent by the practice of such marriages amongst their neighbors in the valley. It is now common for the educated and the well-to-do parents to perform the marriages of their children in the formal way. Polygamy is permissible as per customary law, but it is not looked upon as an act of honor anymore. Polyandry is unknown altogether. Widows or widowers can remarry. Customary law allows divorces, but they are not very common. It is also customary for a groom’s parents or guardians to pay bride price – mostly nominal – to the parents or guardians of the bride. Clan endogamy is taboo. The Misings believe Abotani as their ancestor is supposed to be a son of mother Sun and father Moon of the Heavenly abode. The Mising people inhabiting by the plains believe Gu:mín as one of the earliest ancestors, the forefather of a lineal family of Abotani. The sons of Gu:mín are grouped in clans (opín), the names of which are represented by the existing surnames in the society. They are all blood-related brothers with a social restriction of the matrimonial relationship among them. The traditional chief of a Mising village was called a Ga:m. He presided at the sittings of the village Kebang (the village council), which deliberated upon different matters concerning the wellbeing of the village community as well as complaints of individual members or groups in the community. The Kebang was the legal, judicial and executive authority of the community, although the final say on all matters, barring the ones relating to their faith, was that of the Ga:m. Cases of social and criminal offenses were heard by the Kebang, and persons found guilty were penalized. The Gam has been replaced with Gambura (gaonburha in mipak language) a petty village level agent of the government, since the days of the British. Kebang now denotes an association. A traditional Mising house is stilted. It has a thatched top and is patterned simply like the letter 'I.' It is built usually with wooden posts, beams, truss and supporting forks, but bamboo is used extensively for flooring and roofing. The more the number of nuclear families living in the same house, the longer the ‘ I ’ would be. The granary is built a little close to the house and a cowshed too would not be far away. Mising villages are generally large in size, consisting of around fifty-to-sixty households on an average. The traditional craft of weaving is a very bright aspect of Mising culture. It is an exclusive preserve of the Mising woman, who starts her training in the craft even before she reaches her teens. For the male, she weaves cotton jackets, light cotton towels, endi shawls, thick loin cloths, and, occasionally, even shirtings. 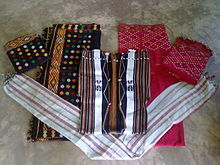 For women she weaves a variety of clothes, such as ege "the lower garment of Mising women", rihbi (a sheet with narrow stripes, wrapped to cover the lower garment and the blouse), gaseng (used for the same purpose as that of a rihbi, but having, unlike a rihbi, broad stripes of contrastive colours), gero (a sheet, usually off-white, wrapped round the waist to cover the lower part of the body, or round the chest to cover the body down to the knees or so), seleng gasor (a light cotton sheet, worn occasionally instead of a rihbi or a gaseng), riya (a long, comparatively narrow, sheet, wrapped, a bit tightly, round the chest), segrek (a loose piece of cloth, wrapped round the waist by married women to cover the eagey down to the knees), a pohtub (a scarf used to protect the head from the sun, dirt, etc. ), and nisek (a piece of cloth to carry a baby with). Before yarn, produced by modern textile factories, was available in the market, Misings used to grow cotton and obtain cotton yarn by spinning. The use of endi yarn, obtained from worms fed on leaves of castor-oil plants, was probably common amongst them. However, they learnt the use of muga (silk obtained from silkworms fed on a kind of tall tree, called som in Assamese) and of paat (silk obtained from silkworms fed mulberry leaves) from their neighbours (other indigenous Assamese communities) in the valley. Even now Mising women weave cloths, using muga and paat silk, very sparingly. Thus weaving cotton clothes is the principal domain of the Mising weaver. She has good traditional knowledge of natural dyes. A special mention has to be made here of the Mising textile piece, called gadu. It is the traditional Mising blanket, fluffy on one side, and it is woven on a traditional loin loom. The warp consists of cotton spun into thick and strong yarn, and the weft of cotton turned into soft yarn and cut into small pieces for insertion, piece by piece, to form the fluff. Weaving a gadu is a very laborious affair like weaving expensive carpets, requiring the weaver to spend a lot of time on her loin loom, and, as the younger women in a family would, generally, not have enough time for such a work, it is the aging ones staying at home that do it. There has been a drastic decline of the gadu craft during the years after independence because of the availability of inexpensive blankets in the market. Misings are one of the most colourful of the various indigenous Tribal communities in Assam. Mising has its own religion named 'Donyi Po:lo'. Donyi (Sun) is the god of Misings. They mostly assimilated with Animism and Hinduism and believes in Supernatural powers and Gods. There are also a large number of Misings who follows Christianity, where the Roman Catholic are highest in number in all major urban mising areas and Protestants are mostly in remote tribal hamlets. Majuli Island district has a large number of Misings who are Christians by faith. Christianity is the fastest growing religion amongst Misings especially among the younger section of the society. In coming few decades Christianity might be the major religion of the Misings. The traditional religious beliefs and practices amongst the Misings are animistic. In the Brahmaputra valley, the Misings have undergone a process of acculturation. They believe in different supernatural beings haunting the earth, usually unseen. These supernatural beings fall into four categories, viz. uyu or ui (usually malevolent spirits inhabiting the waters, the woods, the skies, etc. capable of causing great harm including physical devastation), urom po-sum (hovering spirits of the dead, who may cause illness or other adverse conditions), guhmeen-sohing (benevolent ancestral spirits), and epom-yapom (spirits inhabiting tall, big trees, who are generally not very harmful, but who may abduct human beings occasionally, cause some physical or mental impairment and release them later). Barring the epom-yapom, all the supernatural beings need to be propitiated with sacrificial offerings (usually domestic fowl), both periodically and on specific occasions of illness, disaster, etc. Even the benevolent guardian spirits are propitiated from time to time for the all-round wellbeing of a household. Nature worship as such is not a common practice amongst Misings. But the god of thunder is propitiated from time to time, and although not worshipped or propitiated, the Sun (who they call Ane-Donyi ‘Mother Sun’) and the Moon (who they call Abu Polo ‘Father Moon’) are invoked on all auspicious occasions. In addition, they have embraced in the valley some kind of a monotheistic Hinduism as passed on to them by one of the sects of the Vaishnavism of Sankardeva (1449-1568 A.D.), the saint-poet of Assam. As faiths, the two forms, animism, and Vaishnavism, are poles apart, but they have coexisted in the Mising society without any conflict whatsoever, primarily because of the fact that the form of Vaishnavism, as they have been practising it, has not interfered with their traditional customs (drinking rice beer and eating pork, or using them on socio-religious occasions, for instance). Their religious life in the valley has thus assumed a fully syncretistic character. Mising people celebrate various festivals, though, the two chief traditional festivals of the Misings are the Ali-A:yé-Lígang, and the Po:rag, both connected with their agricultural cycle. Ali means roots and shoots, A:yé means Fruit and Lígang means beginning. Thus the words mean the beginning of sowing of seeds. Ali-A:yé-Lígang is celebrated in the second Wednesday of February month. The festival marks the beginning of the sowing season. The people of this community are mainly agrarian, so the festival of Ali-A:yé-Lígang mark the beginning of a new agricultural calendar for them. Ali-A:yé-Lígang is a five-day festival. The celebrations start on a Wednesday, which is considered an auspicious day by the Misings, with the heads of families sowing ceremonially rice paddy seeds in a corner of their respective rice fields in the morning hours and praying for a good crop during the year as well as for general plenty and wellbeing. Young men and women celebrate the occasion by singing and dancing at night in the courtyard of every household in the village to the accompaniment of drums, cymbals, and a gong. The gong is not used on any festive occasion other than the Ali-Aye Leegang. Similarly, the drums have specific beats for this festival. The troupe accepts from each household offers of rice beer, fowls, and/or cash. After the singing and dancing in this way is over, the youths hold a feast on the third day. The fourth is a day of taboos: activities like cutting trees, using agricultural implements in any way, using fire in agricultural fields, eating eggs, fruit (especially sour ones), frying items of food etc. must not be done on this day. The taboos are over on the fifth day, and the festival concludes with eating and drinking in the evening. A kind of sticky rice, packed in leaves of wild cardamom and boiled, is a special item of food on such festive occasions. Po:rag is the post-harvest festival of the Misings. Harvesting of paddy rice in autumn is very common now amongst the Misings and so a Po:rag is usually observed now sometime in early winter or early spring. But there was a time when a harvest in summer too was very common amongst them and so Po:rag was celebrated earlier in the months of August or September also. It is a very expensive three-day festival (reduced to two days or even one these days, depending on the extent of preparation on the part of the organizers in terms of items of food and drinks) and so held once in two-to-three years or so. Entertainment during the celebrations is open to everyone, young and old, of the village, and invitations are also extended formally to many guests, including some people of neighbouring villages, to join the celebrations. More significantly, it is customary on this occasion to invite the women who hail from the village but have been married to men of other villages and places, far and near. This makes Po:rag a grand festival of reunion. Moreover, apart from the husbands of the women so invited, a group of young men and women, who can sing and dance, is expected to accompany each of them. No formal singing, dancing and drumming contests are organized, but the congregation of many singers, dancers, and drummers from different villages, in addition to the ones in the village, turns the festival into some kind of a friendly music and dance tournament, as it were. This has an amplifying effect on the air of joy that the festival exudes. The sole responsibility for organizing the festival is vested in a body of young men and women, called Meembiur-yahmey (literally, ‘young women-young men’). The organization is run with a good degree of discipline, following the provisions of an unwritten but well-respected code of conduct. Erring individuals are given hearings and penalized if found guilty. Another occasion called Dobur is an animistic rite performed occasionally by the village community by sacrificing a sow and some hens for different purposes, such as to avert a likely crop failure and ensure general well being of the community, or to avert the evil effects of a wrongdoing on the part of a member of the community, etc. The form of observance of Dobur varies according to the purpose. In the most common form, the younger male members of a village beat the walls of every house in the village from one end to the other with big sticks to drive away the ghosts and goblins hiding in nook and corner and perform the sacrificial rite at some distance away from the village, and hold a feast there. Anyone passing unwittingly through the venue of the rite has to stop in the place till evening or pay a fine. Some of the features of Bihu dances in recent times, boys and girls dancing together, for instance, may have been borrowed from the Misings (an indigenous Assamese community). ^ a b "A-11 Individual Scheduled Tribe Primary Census Abstract Data and its Appendix". www.censusindia.gov.in. Office of the Registrar General & Census Commissioner, India. Retrieved 2017-11-03. ^ "A-11 Individual Scheduled Tribe Primary Census Abstract Data and its Appendix". www.censusindia.gov.in. Office of the Registrar General & Census Commissioner, India. Retrieved 2017-11-03. Wikimedia Commons has media related to Mishing people. Societial adaptation to environmental changes: natural resources management and shifting definitions of territory among the Mishing tribe in the Brahmaputra River floodplain (Assam, NE India), by Emilie Cremin, PhD in Geography, University Paris 8 (France). This page was last edited on 22 March 2019, at 15:14 (UTC).